We wish you a very Happy New Year! 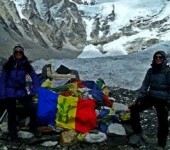 As we approach the 2013 trekking season we are excited to share news about some new treks, wild festivals, and special opportunities for our guests here in Nepal. We hope that we will see you soon. Trekking in the Everest and Annapurna regions of Nepal is popular because of the spectacular scenery and fascinating village cultures, but at times these trails can be a bit too crowded. 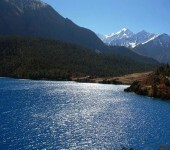 ITrekNepal is introducing two new treks that are every bit as fascinating and beautiful, but currently have only one-tenth as many trekkers each year. 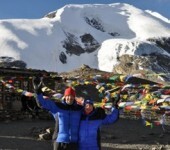 The Manaslu Circuit has been called “the new Annapurna Circuit” and for very good reason. 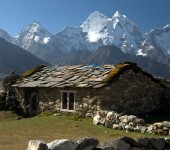 The trek route encircles the Manaslu peak, the 8th highest mountain in the world, and along the route you’ll see an amazing variety of terrain, flora, and village cultures. 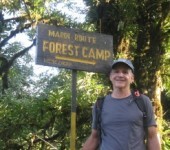 What you won’t see are many other trekkers. 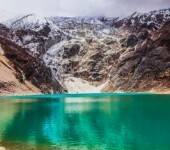 This is a fairly challenging 18 day trek, capped by the crossing of the 5100 meter Larkye La pass, which is well worth the effort as you’ll have extraordinarily close-up views of one of the world’s most spectacular mountains. Along the Manaslu trek route you can also opt to head northeast for several days to explore the remote Tsum Valley, where ancient Tibetan Buddhist villages have remained unchanged for hundreds of years. The scenery around this high, broad valley is also amazing, with panoramic views of awe- inspiring Ganesh Himal and Singhi Himal. 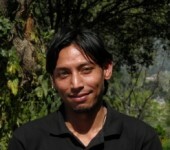 The Manaslu Circuit and Tsum Valley are restricted areas requiring special permits. We’ll handle these details and all the others to make sure you have an experience of a lifetime. When the Hotel Heritage was being built a few years ago ITrekNepal was the first company in Nepal to recognize its potential as the premiere hotel in Bhaktapur, the only deluxe category hotel in the city. The classic design, building materials and furnishings perfectly reflect the spirit of ancient Bhaktapur, combining old world ambiance with modern comfort and conveniences. ITrekNepal is still the only trekking company in Nepal that offers Bhaktapur (rather than chaotic Thamel and central Kathmandu) as the starting point for all treks and tours. So many of our trekking guests have thanked us for helping them to discover this Nepal treasure and making their Nepal experience so much more authentic and pleasant. Best of all, our office is located right next door to the Hotel Heritage, making it incredibly convenient for our guests. Because of ITrekNepal’s special relationship with the Hotel Heritage we are able to offer our standard category guests the opportunity to stay at this deluxe hotel without an upgrade cost. 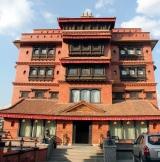 As long as there is room availability at the Hotel Heritage (book your trek early!) you can look forward to enjoying this remarkable hotel experience. Nepal is renowned for its many colorful festivals and none is more exciting than Bisket Jatra – the Chariot Festival – which is observed in Bhaktapur over eight days in April, and heralds the start of the Nepali New Year. In one of the most amazing annual events in the Kathmandu valley, a huge chariot carrying images of the god Bhairab is hauled around the town by hundreds of villagers, and pausing in Taumadhi Square for a huge tug of war between the eastern and western sides of town. After the battle the chariot’s head is taken to Khalna Tole, where a huge 25m-high lingam (phallic symbol) is erected in the stone yoni (female genital symbol) base, after which young men attempt to climb the towering pole to take away the flowers tied at the top (you get the idea…). Throughout the week the Bhaktapur residents celebrate the festival with other exuberant displays of religious devotion. The staff of ITrekNepal, whose families have resided in Bhaktapur for generations, can help you experience this remarkable festival as no one else can. Consider booking your trip to Nepal to coincide with Bisket Jatra. Bisket Jatra takes place from April 9 -16 this year. 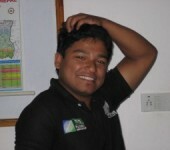 Copyright © 2013 I iTrek Nepal, All rights reserved.